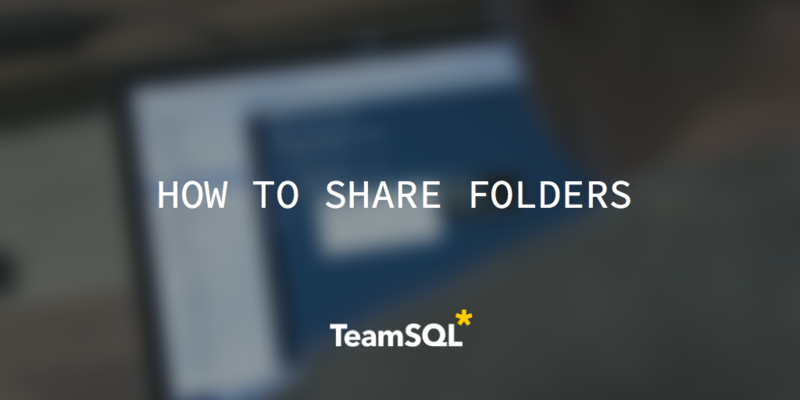 In this article, we will cover how you can share the folders you’ve created in TeamSQL. You can share them with individuals or with groups of individuals. To get started, navigate to the Saved Queries area of TeamSQL. You’ll see a list of all the queries you saved, as well as the folders you’ve created to store them. Select the folder you want to share. You’ll see the options associated with that folder appear in the toolbar at the top. Click Share to proceed. The Share Folder dialogue appears. Choose Individuals to share with a single person. You’ll need to provide the user’s email address. Choose the Teams tab if you want to share with an existing TeamSQL team (which is essentially a group of individuals whose emails you’ve already provided). At this point, the users to whom you’ve shared will receive an email that you’ve shared a TeamSQL folder with them. They will be provided an access link, as well as a link to download TeamSQL if they do not already have a local copy.